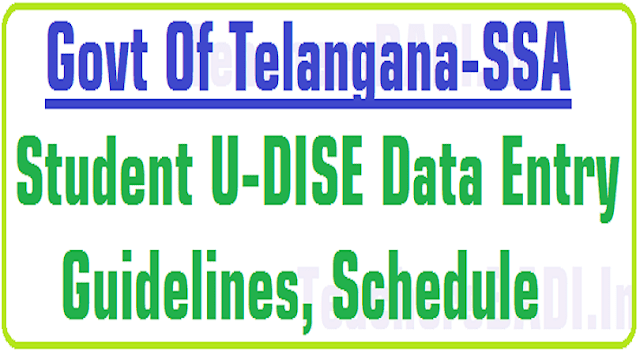 Student U-DISE Data Entry Guidelines, Schedule for 2017-18 in Telangana, TS SSA Guidelines for Collection of Student U-DISE Data 2017-18, Student Data Capture Format, UDSIE Schedule, Student U-DISE Data Entry. Government of Telangana, Sarva Shiksha Abhiyan School Education Department, Instructions to DEOs & POs on collection of Student U-DISE data for the year 2017-18. As per Government of India mandate the information to be collected in Student Data Capture Format of School Education Department right from pre-primary sections to higher secondary / Jr. Colleges. A tentative schedule communicating by indicating dates to conduct training programmes, collection of data, verification at various levels and data entry etc. The entire exercise shall be completed as per the schedule as the data is very much essential for the formulation of SSA, RMSA, MDM Annual Plan and State Government Budget Plan for the year 2017-18. Communication of dates of training programmes to the participants and arrangements for data entry at district point shall be taken up well in advance to avoid last minute confusion and delay in completion of the task. District Collector may be requested to convene a meeting with the officials of stake holder departments i.e., Social Welfare, Tribal Welfare, BC Welfare, TSREIS and Intermediate Education to ensure their coordination in collection of Student U-DISE data from all the schools / colleges. Sub: TSSA, Hyderabad - UDISE 2017-18 - Communication of Guidelines on UDISE 2017 -18 - Certain instructions - Issued - Reg. l.D.O. NO. 23-9/2017-STATS dated:31.10.2017 from GOI MHRD. New Delhi. 2. This office proceedings even no: dated:6/11/2017,10/ll/2017 &14/ 11/2017. All the District Educational Officers and Ex-Officio Project Officers of TSSA in the State are informed that, the schedule for collection of data for UDISE 2017-18 communicating vide reference read above for taking necessary action. Accordingly, the guidelines for collection of UDISE 2017-18 data to the field level functionaries i.e., MEOs / Complex Head Masters / Principals/ Head Masters and instructions to the District Educational Officers and Ex-Officio Project Officers are herewith enclosed. In view of the above, they are requested to take necessary action as per the schedule and guidelines so as to obtain correct and accurate data. They are further informed that the HMs who submit the incorrect data and the field functionaries who scrutinize the data/ persons who enter wrong data will be held responsible and action will be initiated against them as per CCA rules. This has got the approval of Commissioner & Director of School Education & Ex-officioState Project Director Sarva Shiksha Abhiyan, Telangana Hyderabad. 1. As per Government of India mandate the information is collected in Single Data Capture Format of School Education Department right from pre-primary sections to Higher Secondary / Jr. Colleges. 2. A tentative schedule is communicated by indicating dates to conduct training programmes, collection of data, verification at various levels and data entry etc. The whole exercise shall be completed as per the schedule as the data is very much essential for the formulation of SSA/RM.SA/ MOM/Teacher Education, Annual Plan and State Government Budget Plan for the year 2018-19. 4. Communication of dates of training programmes to the participants and arrangements for data entry at district point shall be taken up well in advance to avoid last minute confusion and delay in completion of the task. 1.General guidelines - for supervisory/ verifying officers like DEO & EO POs, Sectoral Officers, MEOs, School Complex HMs, RIOs / DVEOs of Intermediate Education. 3. DCF Part-II (Supplementary variables to specific guidelines) - this part should be got printed al district level equal to the no. of schools and colleges in the r:strict. and attached to DCF (Part-I) and given to the Headmasters / Principals during the training programme for collection of data. 6. A complete set (General guidelines + DCF - Part 1 and Part - II) '& Child Info enrolment form shall be given to supervisory officers in a booklet form./The budget may be met from the MISand Management Cost of AWP&B 2017-18. 7. Filled in U-DISE forrnats shall be collected from all the schools duly verifying with the school records. 8. After collection, the U-DISE data has to be verified at MRC level by constituting a team with CRPs / MIS Coordinators one active teacher, to ensure correct data from all institutions. The verified data formats shall be sent to District Project Office of SSA for data entry at the identified point. 11. Even after verification of data at various levels, certain variations were found in the items like management, infrastructure, enrolment and other facilities during 2016-1 7. Hence, the data shall be verified scrupulously to avoid variations as it is used for various purposes at State and national levels. 12. Data of a mandal shall be entered at district level only under the supervision of the concerned MEO / School Complex HM / CRP/MIS COOD/DEOS to avoid mistakes. 13. Vocational Coursess Format NSQF attached with the U DISE format, to be filled where the programme is implementing. • After entry of data, a printout of school report card of the schools shall be taken & got it verified with original formats. • A minimum of 10 computers have to be arranged to complete the data entry as per schedule without any problem. Head Master high school having ICT/CA2 computers may be identified for data entry in new districts.IN respect of old districts, data entry may be taken up at Diets as sufficient number of computers are available. 1. General guidelines – for supervisory / verifying officers like DEOs, POs, Sectoral Officers, MEOs, School Complex HMs, RIOs / DVEOs of Intermediate Education. These guidelines shall be got Xeroxed at district level equal to the no. of officers. 2. DCF consists two parts : Part - I (Consisting of 35 column format in A3 size with available information of children) - this part should be got printed through software for all schools in the state. 3. DCF Part-II (specific guidelines) - this part should be got printed at district level equal to the no. of schools in the district and attached to DCF (Part-I) and given to the Headmasters during the training programme for collection of data. A complete set (General guidelines + DCF - Part I and Part - II) shall be given to supervisory officers in a booklet form. The budget may be met from the REMS and Management Cost of AWP&B 2016-17. The student data shall be filled as per school records. After collection, the Student U-DISE data has to be verified at 100% School Complex level by Complex HMs / CRPs and 20% by MEOs / MIS Coordinators to ensure correct data from all institutions. The verified formats shall be submitted to MRC for computerization through online in respect of Government schools (Primary and Upper Primary) regarding high schools, welfare schools, aided, private schools and Jr. Colleges the computerization shall be taken at their school / college points.